Olson, of Carterville, Illinois, is a a commercial lending officer for Farmers State Bank. Olson has more than 10 years of experience in the bank industry and has been part of many pioneering projects during her career. She assisted with the inception of the Green Rewards and Bank on Marion programs and has served on the Community Reinvestment Act panel. Olson previously served as marketing director of University Mall in Carbondale, Illinois. She honed her business development skills selling radio advertising and held the position of sales manager for WVZA-FM, in Marion, Illinois. She also served as special events coordinator with Big Brothers Big Sisters of Southwestern Illinois. Olson graduated with a Bachelor of Fine Arts degree with a marketing minor from McKendree University in Lebanon, Illinois. She is a volunteer with Walk to Cure Arthritis/Arthritis Foundation, a chair of Jackson Growth Alliance and a board member for the Marion (Illinois) Chamber of Commerce. MEMPHIS, Tenn. – Jennifer Olson of Carterville will participate in the Delta Regional Authority’s 11th class of the Delta Leadership Institute Executive Academy. Olson, a commercial lending officer for Farmers State Bank, will join other DLI fellows from each of the eight Delta Region states. Participants are nominated by their respective governors to participate in the yearlong leadership training program. “The Delta Leadership Institute is the perfect opportunity to step outside of my comfort zone, job description, knowledge base and physical location to better serve my community,” Olson said. Since 2005, the DLI has worked to improve the decisions made by community leaders across the Delta Region by broadening their understanding of regional issues; building a corps of alumni that have a regional and national perspective; developing a toolkit of resources for addressing issues facing their local communities; and providing the training and professional development needed to extend the pipeline of skilled local leadership within our Delta Region communities. This week, the newest DLI class is conducting its orientation and first session of the executive academy in Memphis, Tenn. The Delta Regional Authority is a federal-state partnership created by Congress in 2000 to help create jobs, build communities and improve lives through strategic investments in economic development in 252 counties and parishes across eight states. Through the Rural Communities Advancement Program, the DRA has provided leadership development to more than 400 community leaders over 10 years and strengthened regional collaboration with its Delta Leadership Institute. 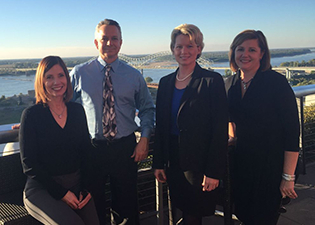 The DRA partners with Arkansas State University, the University of Alabama and the University of Louisiana at Monroe for programming and organizational support of the institute. Learn more about the Delta Leadership Institute at dra.gov/leadership.